Providing full service expertise for every stage of your home building project. The Badger State's Leading Resource for New Home Builders, Remodeling and Commercial Building Projects. Building a new home or starting your next home improvement project? 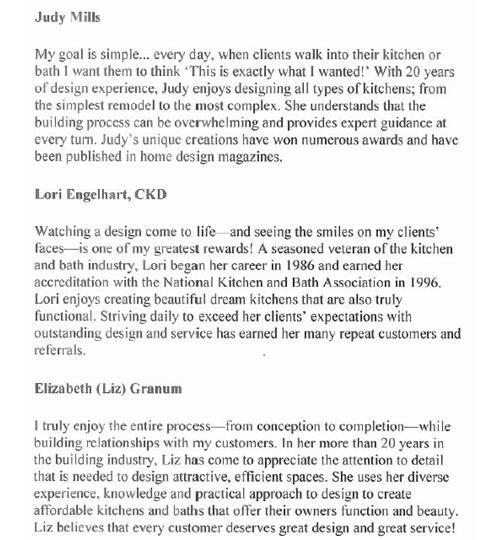 We'd love to have you visit our showroom and experience the industry's latest building and remodeling products. We feature cabinetry, countertops and wood flooring that boast the most current design trends as well as interior and exterior doors, windows, moldings, siding, shingles and hardware making Wisconsin Building Supply truly a "one stop shop". Our seasoned experts are ready to help you make your selections. We will work with you and your contractor to ensure your building products are ordered and delivered to your home in an accurate and timely manner. We are known for our excellent customer service, from start to finish, and look forward to adding you to our long list of customers who come back year after year for all of their building needs. Leading builders come to Wisconsin Building Supply first when starting a new home building or commercial construction project. We know the business and we know the products that are preferred by Wisconsin builders. As a locally owned and operated company, we understand that the needs of a Green Bay-area new home builder differ from a commercial builder in Sussex. And we are ready to be your go-to supplier with the products and services you need to efficiently and successfully complete new home or commercial building. The residential design service at Wisconsin Building Supply will help you with the most critical part of your building project: the planning phase. Planning impacts every aspect of your project - from cost, to materials selected, to logistics, to the potential resale value of your home. With Wisconsin Building Supply you can rest assured that your construction plans will be exactly what you need for a successful project. There are a myriad of issues to consider when designing a new home or remodeling project. By listening to your needs and implementing your vision we find solutions that incorporate all your key design elements without exceeding your budget. Working closely with you - and understanding your unique wants and needs, we can satisfy the requirements that your lifestyle, timeline, site conditions and topography demand. Together, we'll create a structure that is much more than a house; it's your home. And with the expertise at Wisconsin Building Supply, it will meet your needs today and 20 years from now. As a leader among Wisconsin lumberyards and construction material providers, Wisconsin Building Supply has the ability to provide you with a detailed estimate of materials for projects of any size. From a simple deck... to a complex custom home... to the largest commercial project - we can calculate the materials needed for the job. 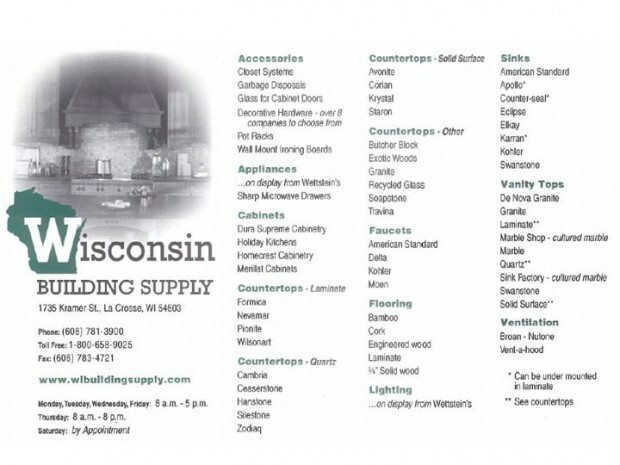 The Wisconsin Building Supply inside sales staff can provide a material list for garages, decks, additions, siding, roofing and window replacement. Our outside sales staff and residential estimators can create detailed material lists for the most complex custom homes. These valuable lists will provide both the quantities needed to build your project and a per piece price for easy comparison. When it comes to commercial buildings, the Wisconsin Building Supply commerical estimating team can work closely with your architect and project managers to create an accurate list that will bring your project in on time and on budget. For your next project, come see the specialists at Wisconsin Building Supply for an accurate estimate to help you save time and money on your next project! Wisconsin Building Supply is a leading supplier of building materials to general contractors, multi-family builders, developers and industrial companies. At Wisconsin Building Supply, our commitment to supplying Wisconsin commercial and multi-family projects is more than just a handshake and a 2x4. We realize that it takes a unique skill set to understand commercial buildings and the materials required for complex projects. Expertise is what it takes... and we have built a team around that expertise. Years of experience has shaped the Wisconsin Building Supply commercial team - which successfully advises and supplies projects throughout Wisconsin, Minnesota, Michigan, Illinois and Iowa. Our commitment starts with our dedication to detail. From professional estimating to advanced component design, you can rest assured that we will do an extraordinary job on your next project. From offering new-age, green, specified products to understanding commercial building codes, our commercial team is continuing to push the boundaries of service, logistics, design and product expertise in the building materials industry. Partnered with top-notch building material manufactures and vendors, you can trust Wisconsin Building Supply will provide only the finest quality products for your projects. Quartz - This countertop material is an engineered stone and needs very little maintenance to look wonderful. It's very hard and is scratch, stain and heat resistant. The colors/patterns are very consistent; so seams don't show as much as in Granite. However, if you are looking for something inexpensive, this isn't your answer. Quartz can be pretty costly. Still, it's an investment worth having because you will love it every time you walk in your kitchen. Granite/Natural Stone - Similiar to Quartz in its properties, but this product is an actual stone quarried out of the earth. Beautiful, natural colors - some patterns are very consistent but others vary wildly. Cost will be similiar to Quartz. This product will need to be sealed once a year or so; a very easy spray on/wipe off process. Laminate - The vast majority of homes these days have laminate counters. They are very affordable, easy to install, and have a large number of colors, patterns and edge treatments. However, there are drawbacks to this popular countertop. Heat can ruin it and seams can be seen more easily. Laminate tops can now have integral sinks; a big improvement over the laminate tops of yesteryear. Corian/Solid Surface - This type of countertop is more of a matte finish and the seams are pretty much invisible. If it's got a scratch or nick it can be sanded out. Sinks can be integral or undermounted. This is a good choice for consumers that don't want the shine and cool feel of Quartz or Granite. Be creative and mix up the tops in your kitchen! Butcher block is an excellent and affordable choice for an island or that small top between your stove and refrigerator. We invite you to our showroom to see the latest styles and colors.